It was day in which history was made for Peyton Manning and the Broncos, and in even better news, it was the best the team has looked all season. 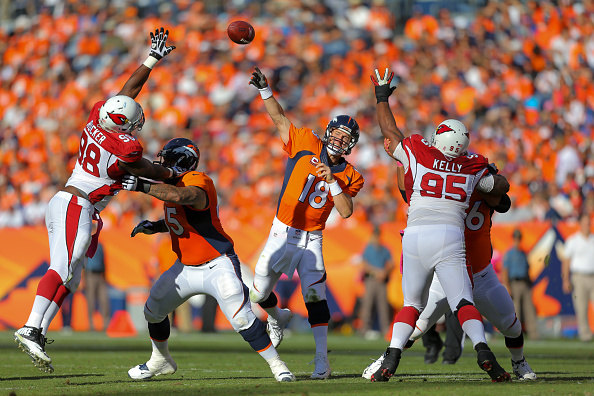 Manning threw his 500th career TD, and three more to boot as the Broncos rolled over the previously unbeaten Arizona Cardinals 41-20 in Denver. “Football is the ultimate team game, and so I guess one man has to accept it and I really accept it on behalf of a lot of coaches and teammates,” Manning said. The win was showcased by not only Manning, but his favorite WR in Demaryius Thomas, who went off against Cards cornerback Antonio Cromartie for a franchise record with 226 yards on eight catches. On the day Manning was sharp, throwing for 479 yards and four TDs, moving him within five of Favre’s record 508. The 500th TD was a 7-yard strike to tight end Julius Thomas, a score that put the Broncos up 7-3 with 4:43 to play in the first quarter. The Cardinals to their credit hung in, even after losing backup QB Drew Stanton in the third quarter after being hit by Von Miller and having to turn to Logan Thomas. Thomas’ only completion was a big one, an 80-yard catch and run to RB Andre Ellington that put the Cards within four at 24-20 with 3:03 left in the third quarter. 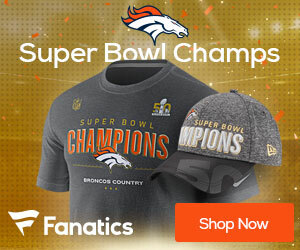 The Broncos offense though would not be stopped, as Brandon McManus kicked a 41-yard field goal which bounced off the left post and through the uprights to make it a 27-20 Broncos lead early in the fourth quarter. Manning and the offense were able to ice the game with two more scores, one on a pass to Julius Thomas from 12 yards out and another on run from Juwan Thompson from 8 yards out to finish the scoring at 41-20. Manning and Thomas were not the only two players to reach records, as Wes Welker made history, as he had seven receptions on the day, enough to move him past Rod Smith for the most catches in NFL history by an undrafted player. He has 854, five more than Smith caught for Denver between 1995-2006. The win puts the Broncos at 3-1, 3-0 at home this season. They are still neck and neck with the Chargers, who beat the Jets at home 31-0 on Sunday.